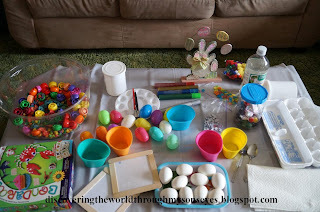 Easter sensory bin, dyeing eggs, decorating plastic eggs, making a Spring picture frame, and a cute Easter egg wall decoration. 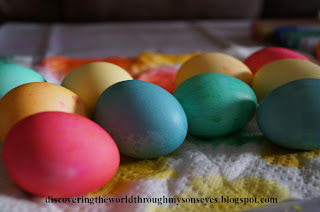 Dyeing eggs with water, food coloring, and vinegar. They were so super excited! 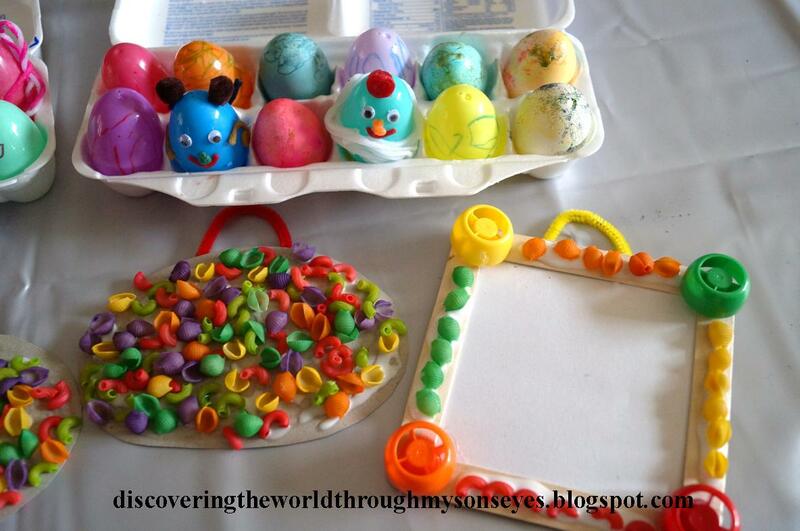 Look at those beautiful Easter eggs! 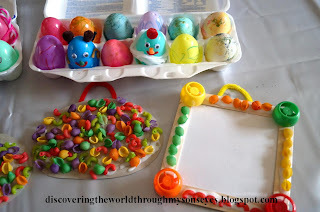 Easter sensory bin with plastic eggs, colored pasta, and colored caps. 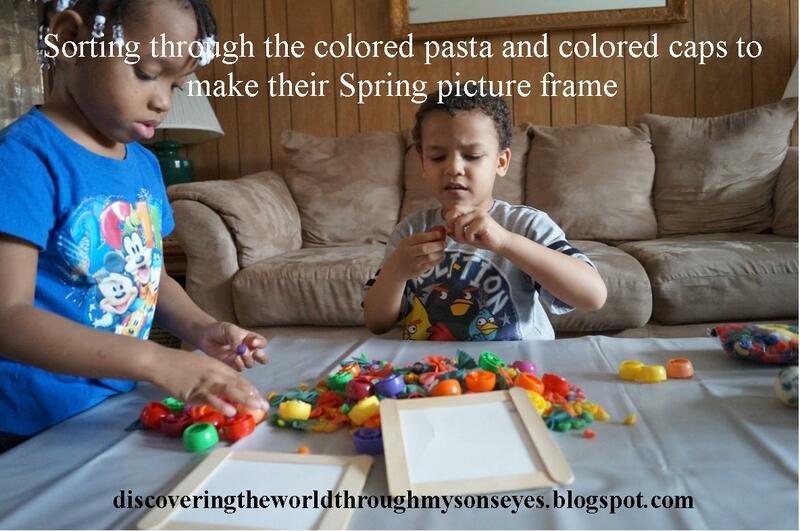 They played with this for a while until it was time to make the Spring picture frame. I had the picture frames ready for them. I used four large popsicle sticks, and hot glued them. For the back I used a cereal box carton, and left the top unglued so they can slide a picture in them. I glued in the back chicken wire (chenille stem) for hanging. This is my son's creation! 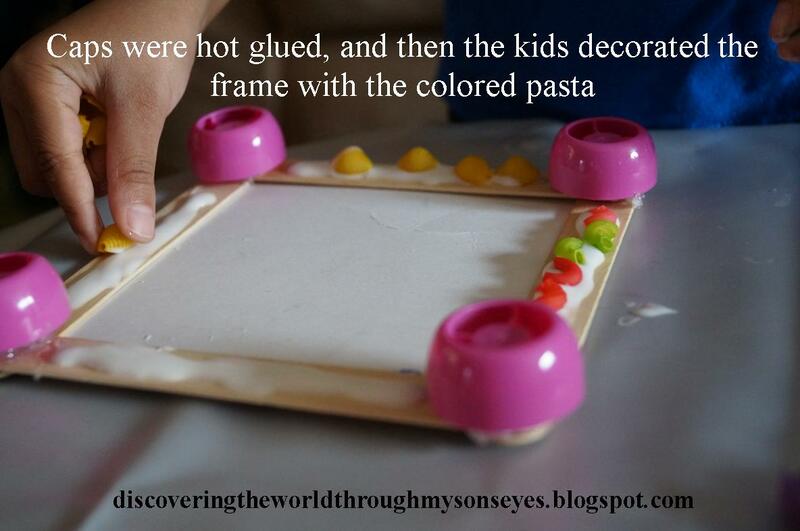 As you can see he color coordinated his picture frame with the caps, and colored pasta. This is my son's friend's creation! She picked pink color caps, and used the colored bow tie pasta. This was such an awesome day! The kids not only had fun, but it was also a sensory learning experience in which they practiced various skills: such as counting, sorting, discovering what they liked and the differences in their choices. For instance my son's friend preferred the pink caps, while my son went with four different colors caps. 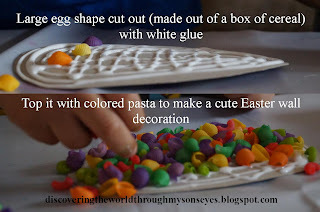 She used two pasta bow ties, and used different colored pasta, while he decided to color coordinate the pasta with the caps he chose. 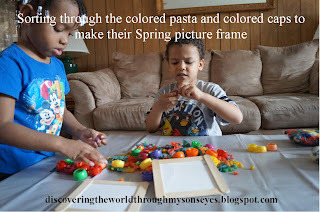 They also practiced their math skills by counting and making sure they had enough pasta to complete their picture frame. 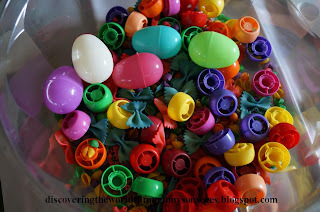 Also sorting through the colored pasta by color and then size they were developing critical thinking and classified skills. Will you celebrate Easter? If so, what will you do? 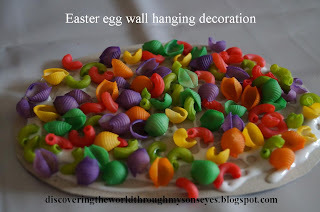 I would love to hear your thoughts, ideas and comments! 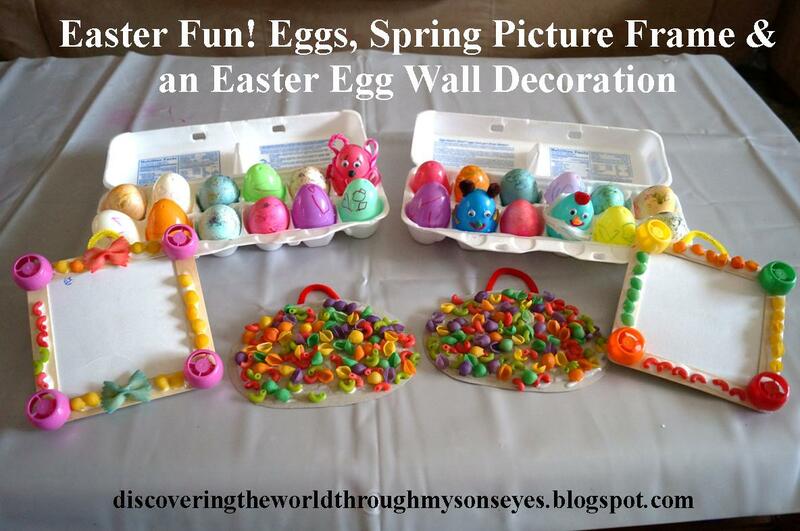 Please like, share or pin! ¡Hasta la próxima! 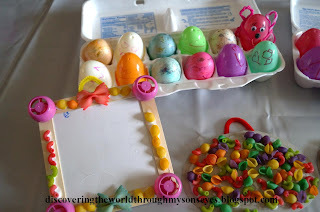 This post has been linked up at Sharing Saturday at Crafty Moms, Kid's Get Crafty, The Iowa Farmer's Sunday Showcase, and Rainy Day Mums Tuesday Tots.